This article pertains specifically to the earlier model year Phoenix Cruisers that have the Tripp-Lite brand inverter installed. This may or may not apply to the newer models with the Xantrex inverter. Historically we had a lack of battery power with our 2007-2350 when camping without 110V hook-up. Because we camp without 110V most of the time, this becomes a regular problem. I experimented on weekend get-aways this year with the power inverter, soon realizing a significant improvement in battery reserves by keeping the inverter powered off except when needed. I did so using the little switch on the inverter itself, not using the control panel. I later discussed this with Kermit of Phoenix USA. He educated me on the Tripp-Lite power inverter. He said it uses 12 amps when sitting idle. It is not an issue if you drive the RV, then plug into 110v when at your destination, as most people do. But if you stay in a primitive campground without 110v hookup, you need to make a simple modification. On the black Tripp-Lite control panel, plugged into the side of it, is a head phones style jack. Simply unplug it. Doing that disables the auto-on feature, utilized by the kill-all/power-up switch at the RV's entry door. The inverter is then controlled exclusively at the Tripp-Lite control panel. At that panel, when switched to Auto-Invert, the inverter is ready to generate 110v on demand. In that mode, the inverter is consuming 12 amps. When switched to Line/Charge Only, the inverter is off so you loose your 110v, but the batteries would still get charged if plugged into 110v or when the generator is running. In Line/Charge Only mode, you have stopped that 12 amp battery drain. Regardless if the head phone plug is in or out, your batteries will always get charged when driving the motor home. On our 2007 2350, you can unplug that connector by simply reaching up behind it from below through the cabinet door underneath it, unplug it from the right side. The other connector, a telephone style plug facing down, must be left plugged in. If you can't get to your plug that way, just remove the 4 front panel screws to pull the panel forward, which is easy enough. Now we leave the Tripp-Lite control panel to Line/Charge Only (inverter is then off) except when we want to use a 110v appliance. That saves the batteries. We are now able to camp without hook-ups for an extended period of time. Great info, thanks for passing it on. I had not found that info in the manual, and it will keep the batteries from occasionally discharging when I am away and not plugged in. We just returned from a 3 week vacation. We had plug-in power for only 2 of the 22 nights. We hardly drove our PC once at our destinations so the Ford V10 engine didn't do much charging of the coach batteries. We ran the generator about 2 hours every-other evening, using a Black & Decker 40/20/10/4 amp smart charger, on the 40 amp setting. I did have to add distilled water to the batteries midway through the trip and again after we got home. 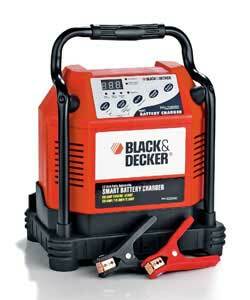 Here is the Black & Decker 40 AMP smart charger in action during the 2 hour generator run times. The read-out in the picture states 11.7 AMPS at the time. It provides 40 amps compared to the 20 amp output of the inverter which reduces our generator run times dramatically. The Black & Decker smart charger was bought at Wal-Mart for $94. I've been researching and reading posts on the Cruiser's Forum since last winter. I purchased an 07 2551 early this spring and love it. Like you it seems, one of the things I like most about owning an RV is getting set up just the way we like it. It's a hobby. I really like reading your posts because it seems you address lots of the things or questions I'm thinking about. 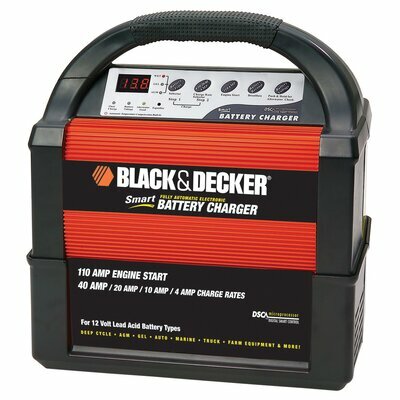 I have a Black & Decker BC40EWB on the way!One of my next projects is installing the battery shield from the tires. Question 1: DIM INTERIOR COACH LIGHTS? Do you (or anyone else) experience dim coach lights when running off battery power? It seems more often than not my factory fluorescent lights don't power up all the way when running on battery power. Sort of like when you're trying to turn on a fluorescent in cold temps. but it hasn't been cold necessarily. They're fine when hooked to shore power. Question 2: Could you send me more detailed info. about how you added the pressure tank on your RV please? r.sackett@mchsi.com Any tricks to winterizing now with the tank? Do you have a by pass installed or do you have to fill the tank with antifreeze. Question 3: Did you contact ShurFlow about how much you could shroud your water pump? I was thinking of making a sound deadening shroud as well but didn't know if that's OK for the pump, air flow, etc.. Thanks for all the info. and great ideas! About your dim fluorecent lighting. It sounds like either your batteries are not holding a charge, or the terminals to the batteries are extremely corroded. Be sure there is adequate distilled water in the batteries, and they are holding a charge. Water likes to boil out quickly from RV batteries in general. On my 3 week trip where we electric only 2 of 22 nights, I had to add water 1.5 weeks into it, and then again when I got back home. I sent you the write-up and pictures of the water pressure tank. When there is no water pressure, the tank is 100% empty. A badder inside with 20psi air pressure, forces all the water out. I don't winterize my 2007 2350 because I have a heated garage. I do empty the fresh water tank through it's valve. I also open the two low point fresh water pipe valves, and also the hot water heater. During the process, I open all faucets and showers (inside and outside) to encourage good draining. Winterizing with the pink anti-freeze is better answered by others. The water pump gets cooled from the water running through it. There is no concern of shrouding it. I am very happy with the shroud as it protects the pump's delicate plastic fittings that could be broken with camping gear. The quiet pump is also great. It doesn't wake up anyone when flushing the toilet in the middle of the night. Recently someone asked me some details about the Black & Decker charger I bought at Walmart. It appears they no longer offer it. I did a search on the internet and see that Black & Decker changed the charger styling, but having the same general functionality. The new design HERE seems to take less storage space than ours. Sears On-line offers it with free shipping for $106.02 as SEEN HERE. I also wanted to mention that my B&D charger had something go wrong earlier this year. It has a high velocity cooling fan, a small version of the type used in computers. The fan locked up on me for no good reason. I was able to find a replacement where I work. With a little modification to the replacement fan, soldering the two wires, and insulating them with shrink tubing, all is well again. That fan should not have failed considering the limited use of the charger and how well I kept it. Hopefully the newer charger design has a better cooling fan inside. Just a question for Ron: Why is the battery charger needed when running the genny? Doesn't running the genny charge the house batteries? Or is that the point that you fellows are making -- that only running the engine battery charges the house batteries? This was never a concern for us with the Pleasure Way. We would run either the engine (around town, to the park, etc) to keep the chassis and house batteries up, or leave it parked and alternately run the engine or the genny (in our more snowy Illinois months). Never had a problem with the house batteries. I obviously need a little education in this. Thanks! Both the generator and main Ford V10 engine charge the batteries, and they do so effectively. The generator (and shore power) charges through the inverter. The Ford V10 engine charges through the alternator. The problem we experience arises when our motor home sits for a number of days at a primative campsite without available shore power. Daily use of 110v appliances (via the inverter) like making coffee and watching movies, drains the batteries quickly. Of coarse the answer without available shore power is to run the generator or drive the motor home to charge them up. We do tow a Jeep Liberty and use it for our all-day excursions which means our PC can sit for many days without starting the Ford engine. So we then rely solely on the generator for battery charging. Our problem with this is that the generator has to run for many hours to restore the batteries. Our 2007 Tripp-Lite inverter outputs 20 amps, but our Black & Decker outputs 40 amps which basically cuts the generator run time in half. 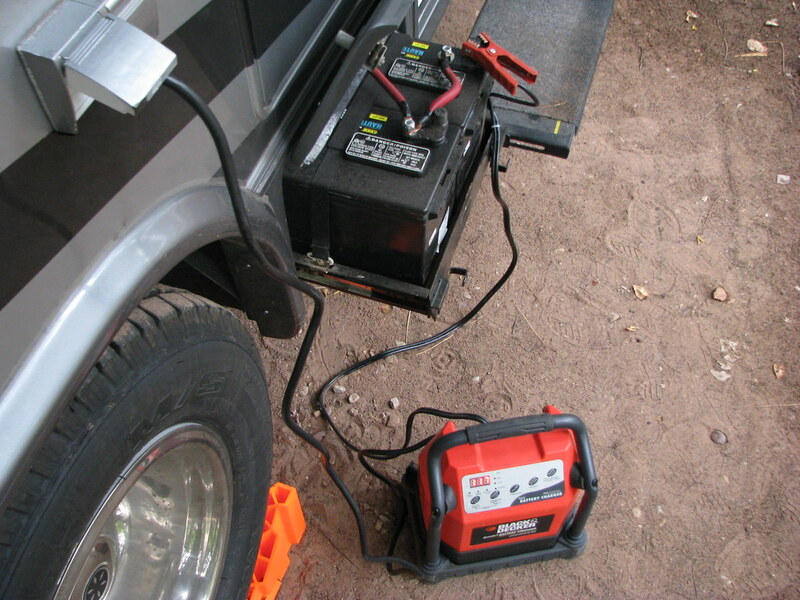 In many campgrounds, generator usage is restricted to certian daytime hours. We often leave our campsite early with the Jeep, and return late giving us little time to charge our house batteries. The B&D 40 amp charger makes up for that. If you drive your PC daily, or are plugged into shore power often enough, then I think the 40 amp B&D charger may be of little value. But with our daily routine, we found the B&D to be the answer to our battery troubles. Admittedly, we vacation differently than most people. what about using a solar trickle charger. such as what some fisherfolk use on their fisherfolk boats and/or shore stations. or what vw used to put in the cars, on the dash, during shipment. I had wondered about those huge solar panels that some here have mounted to their roofs, but given we seek shade tree campsites all the time, they wouldn't be putting out much. When you hook up your 40 amp charger while running the generator, do you disconnect the house batteries first to prevent back feeding into the converter? My understanding is that on the newer converters, back feeding can cause them to over heat and possibly cause a fire. You would then have a pile of ashes where your PC was sitting. If you did not have a battery problem with your PW then you should not have a problem with your PC. The PC has newer technology so it will be better than the PW. Save your money or put it into the gas tank and enjoy your PC. As the Australian say "No worries, mate". Your concern came up before but my recollection is a bit foggy. I recall it's okay because the inverter thinks the batteries are charged and then gets out of the charging mode. The voltage across the batteries while hooked up to the B&D is within proper 12V system standards. The inverter simply thinks the batteries are fully charged. The same rules apply as done with a car battery. A running engine with a battery charger hooked up to it does not damage anything. Just like with a car, if I didn't have the two batteries to dump the power into, say simply hooking up the charger to the RV without batteries to absorb the energy, then I wonder what bad things could happen. But given it's a smart charger that reduces the amperage as the batteries recover, there is no excess power in the electrical system. Keep in mind I have an older Tripp-Lite. Tom, your concern may be valid with the Xantrex. Before following my method here, PC owners with a Xantrex should heed your warning and do some research. you beat me in replying. Marilyn, Tom is correct!